I love when Devin has the weekends off and we are able to take a trip to our favorite farmer's market in the city (which is pretty rare with his busy chef schedule)! We love picking up fresh produce, homemade jams and a bouquet of flowers - and usually a warm baked good or crepe to munch on as we cruise the veggie-filled aisles. I never want to look like I spent loads of time getting ready when I'm at the farmer's market. I love to wear my hair in a top knot, find a cute romper or sundress, put on some comfy shoes and pick some simple accessories. 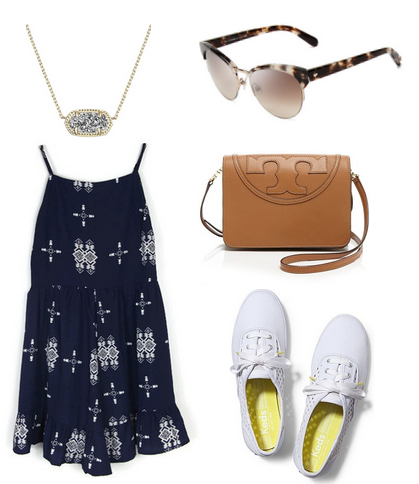 I love adding a little Kendra, Kate and Tory into my casual outfits. Speaking of Kate Spade, how adorable are these Kate Spade Ziba Sunglasses? And what's even better...you can get them with your prescription! My biggest struggle since I started wearing glasses and contacts a few years is finding a CUTE pair of prescription sunglasses. Salt City Optics has great brands like Kate Spade, Ray-Ban and TOMS. If you're in the market for a new pair of prescription or non-prescription sunglasses, check out Salt City Optics before the summer is over!